The Airwheel S3 leaves absolutely no pollution and produces no emissions whatsoever (even with a 520WH power system). This is because the entire power source of the Airwheel S3 is due to the lead acid battery (Lithium). All it requires to charge is a standard household electrical socket. When you feel like taking the Airwheel S3 out for a ride (after the battery finishes charging, of course)… expect to drive at a maximum distance of 10-18km/h (6-11 mph) for a total of 30-35 km (18-21 miles). With that out of the way, riding the thing is sometimes an issue for people and other Segway Clones. Not so with the Airwheel S3, which is rather easy to “mount.” It takes virtually no effort to climb on – as you merely grab the handle… and step on. Easy peasy, right? The difficult part comes when you start moving; stabilising yourself before riding onwards is crucial. Otherwise, you’re asking for an accidental collision or somehow throw the Segway Clone “under” you as you slip off. However, the vehicle’s handles work just like a motor-bike: push for go, pull back for slow. Given how easy transportability is, you’d think you’d see more of these vehicles on major roads and busy highways. There’s a reason we don’t: these vehicles are simply unsuitable for “busy” traffic sections. Not to mention the fact that there’s a chance you’ll hold up traffic (and cause some bouts of unnecessary road rage). However, if there are any back roads or low-traffic streets in your town, by all means feel free to take them! The Airwheel S3 is a travelling vehicle, meaning it can take you to local shopping malls, cafes, a friend’s house, grocery stores, or anywhere else in your town that’s within the maximum distance. Now, the Airwheel S3 can only be turned off/on with a remote. Without it, the machine won’t operate. So if you lose the remote… you’re in trouble, and here’s why: although the manual on/off switch makes the S3 itself go… this manual switch doesn’t turn the vehicle on/off. Only the remote can do that. Although I can see why this was added as a protective step against theft, it’s a tad annoying having to press both the switch and the remote simultaneously to get the S3 on and up and moving. When you see the S3, you might think it’s a “reduced” version of its older brother – the larger (and frankly, more expensive) Segway. While it is drastically lighter—at 22 kgs./48 lbs.—and fundamentally (by design) smaller than its Segway brothers, the S3 has far more beneficial features than a traditional Segway. For example, the S3 has blinding-bright LED lights along its control shift-stick. For added rider visibility, manufacturers put two LED lights on the front, and break lights on the rear. This added protection of safety makes the S3 a safe bet for night-owls, or anybody who can’t resist the urge for some night-time cruising and adventure. It’s similar to Segways, however, in the way it still transports you from point A to point B in as short amount of time as possible (and make you look awesome all the way). Instead of a traditional brake system (based on friction – such as most modern Segways are made with), the Airwheel S3 utilises a system based on controlling the module of gravity. What that means is this: the Segway Clone stops itself (on your command) by focusing on the center of gravity – making stopping motions far more effective and safe for riders (you). This “new” stopping mechanism makes the Airwheel S3 highly efficient for ensuring the maximum riding enjoyment. What really separates the S3 from Segway? 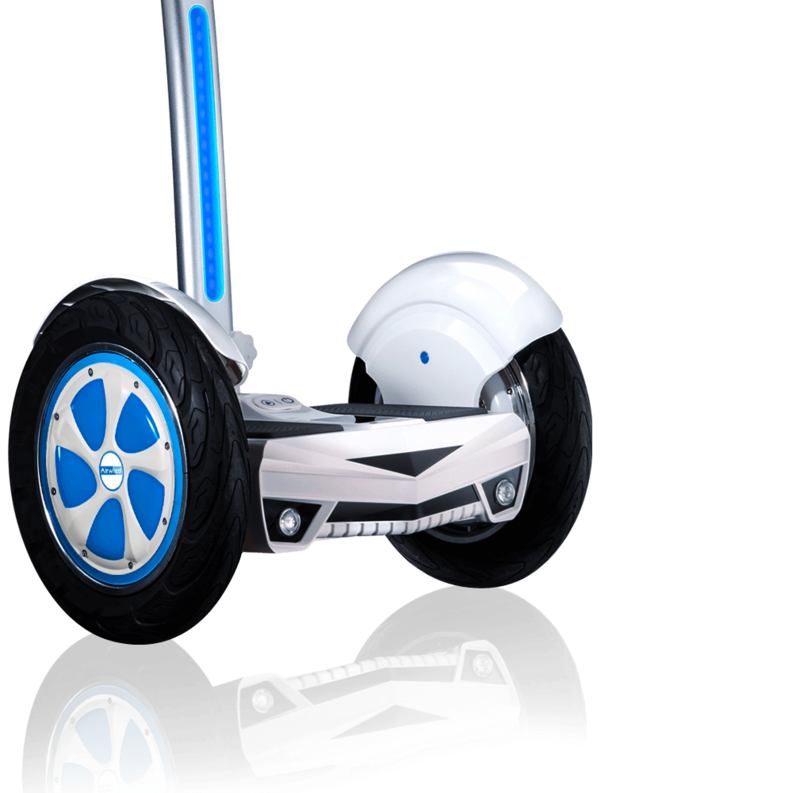 Well, when we get down it: the largest difference between the S3 and Segway is the LED display. This LED display shows you critical information that’s valuable to know when you’re riding: such as speed, odometer, and battery status.